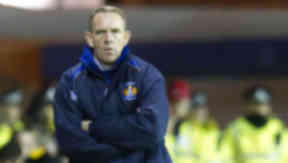 The Kilmarnock manager labelled his side as underdogs ahead of their quarter-final tie. Kilmarnock manager Kenny Shiels claims Hibernian's infamous long wait to win the Scottish Cup puts the Edinburgh side under more pressure. However he believes the Hibees will still be hurting from the Hampden heartache caused by city rivals Hearts in the final last year. Pat Fenlon's side lost 5-1 last May which prolonged their run without Scottish Cup glory beyond 110 years. Shiels said: "There's a lot of pressure on Hibs because they haven't won it for 100-odd years. "As a club that puts pressure on the players. There is so much pressure on those players. "With us being the underdogs, it takes a little bit of the pressure off. When asked whether last season's final put more onus on Hibs, Shiels said: "I think it's an incentive for them. I wouldn't say it was added pressure. "I think it gives them a good incentive to get to Hampden again." When the sides met on Wednesday night Kilmarnock lost two late equalisers as Hibs stayed one point ahead of the Ayrshire side in the SPL. And Shiels believes the tight nature of the league leads to good preparation for the unique nature of a cup tie. "Cup runs are important to all the clubs," he said. "There's a semi-final at stake. "Football drives me on no matter what. You want to win games. Some of them are very, very important and high risk. The difference between winning and losing can be huge. "If you go out of the cup it can produce a negative energy and we have to guard against that. "The league games are cup games at the moment because there is so much at stake. "There's a chance to get into Europe or a chance to get in the bottom three. "There is so little between the situations that it's quite intense at the minute." Killie are without Manuel Pascali and Borja Perez because of hamstring injuries and Shiels has doubts over James Fowler and James Dayton. But Kris Boyd could feature after getting some part of an under-20s game with Motherwell on Thursday. "He did fine," Shiels said. "He hasn't played for quite a while so it was good for him to get some game time. There's a chance he will play."